Children have an innate sense of dignity. When they come to us at Velugu, even from loving families, more often than not their confidence has been bruised. What we do is quickly begin to restore this sense of self. Next we set tasks: there have to be goals which are right for the individual condition. Putting a ball in the bucket, writing the alphabet, enunciating words their ears are unable to hear. These activities have to be followed with encouragement, not pressure, with love and patience, not criticism. We hold the lives of these children in our hands, and it is our job to teach them the way they can understand and respond. These children are achievers, each one. Read some happy stories about children who have let their special abilities shine! Lavanya belongs to a poor family of farm labourers in Kosuvaripalli village H/o Tamballapalli mandal, Chittoor District. The adults work as daily wagers and can scarce manage two square meals a day. Before she came to us at eight years of age, she had been languishing in a corner, unable to speak or walk properly. 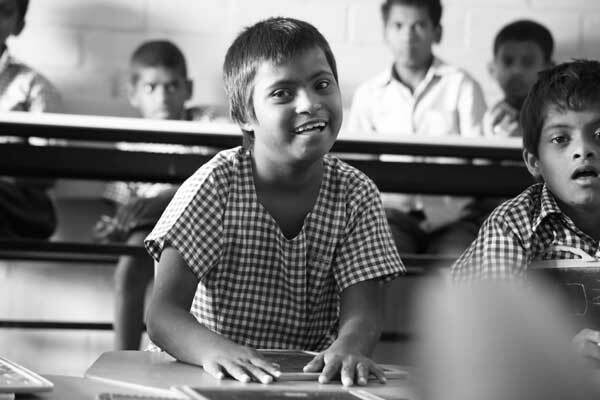 Her illiterate parents were unable to attend to her or understand her condition. When we learnt about Lavanya’s condition, our staff took the initiative and talked to the parents. The parents felt greatly relieved when we admitted her in our special school on 14th March 2009. Our staff quickly assessed the level of her Mental Retardation. With the help of appropriate educational aids, they began her special education once she was comfortable and adjusted to the new environment. As days went by, the child Lavanya started responding to our efforts, slowly and steadily. She showed improvement as she was able to attend to her needs and daily activities. She displayed interest to study and was found equally interested in playing a few games. In course of the next 3 years, she improved a lot both in education, behaviour and in extra curricular activities. She participated in the district level sports and games held for the disabled children at Thirupathi during the year 2012, getting first prize in running race. Observing her steady progress, the girl was admitted to the 4th class in a regular school – Nehru Municipal School – on 14th March 2013. She proved to be very good. The school teachers were impressed by her performance and conduct: they said that Lavanya was no less to any other normal child. Her parents, who in the past were neglecting the girl, are now quite happy with her sustained development and are proud of her. They say that their daughter is now normal. We monitor her progress with great satisfaction and happiness. We all wish her good luck and a prosperous future. Lavanya’s type of disability : ……..